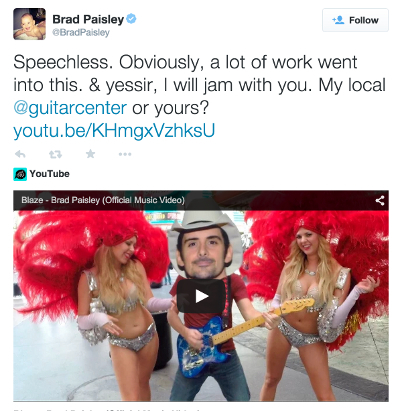 Brad Paisley made good on his word to jam with a fan who made a tribute video on behalf of the country guitarist. 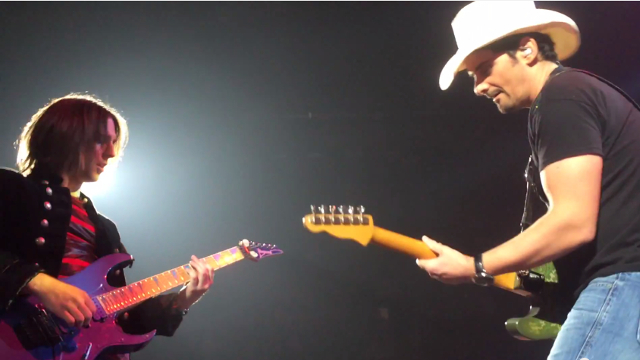 Paisley invited young guitarist Blaze to join him onstage March 5 for his show at Colorado Springs World Arena. Paisley even paid for the Las Vegas guitarist to fly out and provided his family with tickets. Blaze, who is 21, first got on Paisley’s radar with his YouTube video for his song “I Want to Jam with Brad Paisley.” The video depicts Blaze and Paisley—actually Blaze wearing an oversized Paisley mask—jamming, playing poker and video games and hanging out with showgirls. It also shows off Blaze’s considerable shredding skills. Blaze posted the video on YouTube on January 20. The next day, Paisley tweeted his reply. The gig was literally a dream come true for Blaze. The young guitarist has been playing professionally since he was 12 and earned the name Blaze for his fast-as-lightning picking. Though Blaze has been a fan of everything from blues to classic rock to metal, he recently became a fan of country music thanks to Paisley’s amazing proficiency on the guitar.